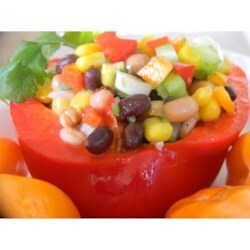 Combine the black beans, black-eyed peas, pinto beans, shoepeg corn, celery, cilantro, red and yellow bell peppers, green onion, pimento peppers, jalapeno pepper, and garlic in a large bowl. Set aside. Bring the rice vinegar, olive oil, sugar, salt, and black pepper to a boil in a saucepan over medium-high heat until sugar is dissolved, about 5 minutes. All to cool to room temperature, then pour over the bean mixture. Cover and refrigerate for 2 hours or overnight. Drain before serving. Black beans and black-eyed peas are marinated in a fiery dressing. I took this to work needing a vagan option that even the non-vegan co-workers would eat. It was a big hit by all parties. This will be a keeper recipe. Great bean salsa! I made this for New Years! This is really good, but definitely need to cut down on the olive oil, 1/2 cup is way tooo much. Also, its good without the salt and pepper.